Most mammals have mites that live in their fur and that don’t usually seem to do them much harm. People don’t have these mites, probably because we don’t have much fur, but other primates do. These ectosymbionts are highly specific to their particular hosts and are modified in various ways to cling to their hosts hairs. They slide up and down the hair to access their food (which mostly seems to be oils and other fatty materials) and probably to regulate their temperature. In the case of the koala fur mite, Koalachirus perkinsi (Domrow), the first two pairs of legs and their bases tightly clasp a hair of the host (you can see a ventral view of the mite with the groove that receives the hair here). This particular mite came from a sickly koala at a rehabilitation centre. Too ill to spend much time grooming (which usually keeps the population in check), the koala was literally crawling with mites and I was brought a large vial of them to identify. Much to my surprise, when I opened the vial a horde of mites scrambled out and dashed helter-skelter across my desk. Although the front legs look inappropriate for mad dashing, they have slender pretarsi that are folded out of the way when riding the hair. When unfolded they are capable of surprising bursts of speed, which I suppose helps them get from one koala to another. This entry was posted on April 30, 2009 at 9:20 pm and is filed under Astigmatina. You can follow any responses to this entry through the RSS 2.0 feed. You can leave a response, or trackback from your own site. Look at that whorl pattern – it’s a mobile fingerprint! Yes, just like a fingerprint and similarly the ridges are called plications. The soft cuticle in mites is often plicate and sometimes even more wondrously complex. Matti Uusitalo, a Finnish acarologist, has produced some amazing SEMs of the cuticle of some of these mites. My name is Sinikiwe and I am interested in licensing your image for Men’s Health Magazine. Could you please contact me ASAP. Have you seen other mites with the spider-web-like strands connected to the legs? I have, the much longer strands wove around the hair shaft like nothing I’ve ever seen before. Perhaps it was a mold of some type attacking the mite though, I don’t know. Some mites do have fungi growing on their surfaces and the hyphae can look hair like. There are also some oribatid mites that are covered with long wooly filaments of cerotegument that make them look like little sheep, and in some (e.g. Epidamaeus floccosus), the wool grows out from the setae too. My original comment wasn’t a very good description. The mite I saw was attached to a hair shaft. The legs of the mite were gripping the hair, but did not exactly surround the hair. The spider-web like filament wove around the hair shaft many times in what looked like an attempt to keep the mite in place. It looked intentional. The filament, or hyphae, was only concentrated in this function, as I recall. I am just curious about it. 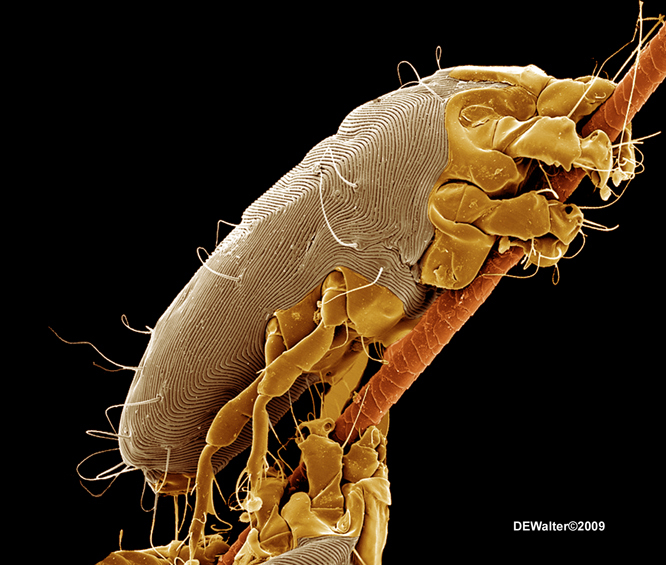 Do you know of any other free online mite photo catalogs? You have produced extremely excellent work by the way. 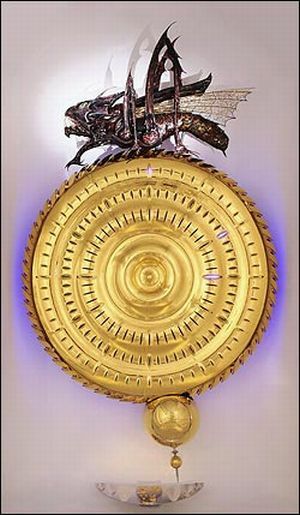 Great clock! There is a group of mites that spin silken retreats on the skin of their hosts where they lay their eggs or moult. It is possible that is what you were seeing. Cats, dogs, and rabbits each have a species-specific mite in the genus Cheyletiella. The common name is Walking Dandruff – the adults are transluscent and look like little skin flakes that scamper along. Many birds have similar mites that produce silken retreats at the base of feathers on their hosts. Are you still producing this type of work? If not, how many photos do you have yet to put online? I’m just curious. Scary movies got nothing on your… art work. The design of the mites you showcase are amazing, and the colors brilliant. I didn’t want to look into mite photos, but it has been an interesting ride. I don’t think my description is off, it looked just like that clock. From the limited photos of Cheyletiella I have seen, it’s not even close, but I suppose there are many unphotographed species.